BULL OR NO BULL? Testing a pressure cooker that goes into the microwave! PHOENIX — Are you looking for a fast way to make the hearty and healthy meals? We tested out a product that may be your solution. It's called the ' Handy Gourmet MicroMaster Microwave Pressure Cooker' , with two-and-a-half quart capacity, and it comes in a variety of colors. The claim is you can enjoy the benefits of a pressure cooker with the even faster cooking times of a microwave, but will it work? Stewed chicken, rice and pasta are on our menu. The instructions are simple. Fill the 'MicroMaster' with all of your ingredients, secure the top, warm it in the microwave and you're ready for your gourmet meal. For the rice, we added one cup of rice to one-and-a-half cups of water. We opened the knob, and set the microwave for nine minutes. When the time was up, we checked on the rice, and it was cooked completely! The process was the same for our egg noodles, except this time it only took five minutes, and we didn't have to stir! The real test is for the stewed chicken. Would it be done in 15 minutes, and will it be tender? Why yes, it actually was! And it didn't look or taste like a microwave meal. The 'MicroMaster' has a built-in adjustable steam control vent, and maybe that's why it was juicy. We were curious if we could do the same thing without the 'MicroMaster'. We made the same chicken meal, but this time using a regular glass container. In 15 minutes, the chicken was actually done, but it did not taste like the same meal. When we tried putting the rice in the glass container, it left a mess and was not edible at all. 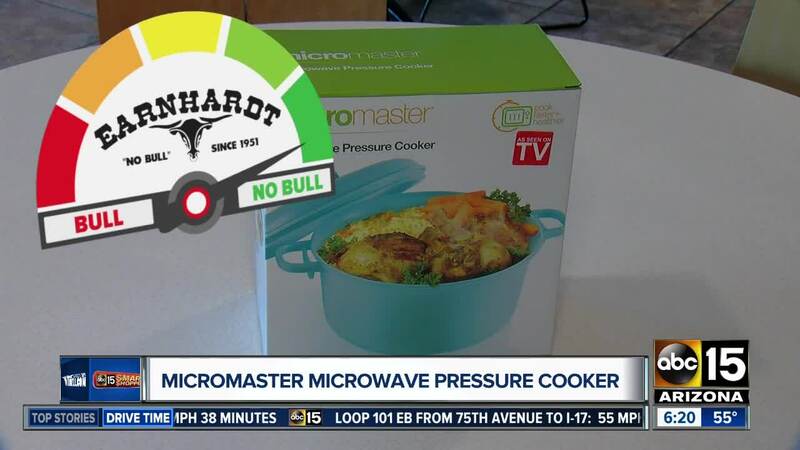 So, where does the 'MicroMaster Microwave Pressure Cooker' rank on our 'Bull or No Bull Meter'? I'm going with NO BULL! It did live up to its claim of cooking foods faster and easier. We bought ours for $9.99 at Fry's Electronics. It came with a recipe booklet and measuring cup. 'MicroMaster' is supposed to limit time spent on clean up since you're using less pots and pans. The item is also supposed to be durable, made from dishwasher-safe plastic. We did not test that claim. What items do you want us to try before you buy? Email me !